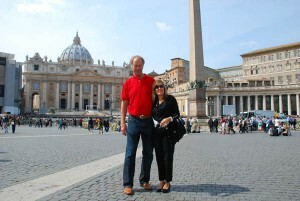 Happy to have seen St. Peter's Basilica, together. Travelers know that major tourist sites have a lack of available toilets, especially for women, who seem to always have to stand in a very, very long line in order to use the scarce facilities. So it was at St. Peter’s Basilica in Rome recently, when my guest had to go and the only option I could think of was a toilet located outside the church near the Vatican post office. Leaving her husband to wander around the massive church, I escorted my guest past security and out to the W/C, letting her know that I would inform her husband of our whereabouts and set a meeting point and time. Finding Rick inside the massive church was not as difficult as one might imagine, due to his height and the fact that he was wearing a colorful shirt. We set a meeting point and time, and I left the church again, passing security. Now came the hard part. Finding Linda, I walked with her back to the exit and there we were stopped by two earnest security men who refused to allow us to enter through the out door. I explained the situation, but the steadfastly refused to let us in. I asked “what was the alternative?” They told me there are W/Cs near the exit from the Sistine Chapel. Frankly, and I’ve been to this location a dozen times, I didn’t see them. Perhaps they were obscured by a huge line. In any case, here we were, trying to get into the world capital of religion and we were being stopped cold by two very hard-hearted guards. Now, I can understand crowd control and how difficult it can be to control many thousands of people. But to let a petite Canadian and her guide back through the line after a much-needed break? What is the harm in that? Will it cause St. Peter’s to come crashing down? Exhausting all of my skills, I asked the guard “Who will go into the church and retrieve her husband? Do you know what he looks like?” I announced, “I’m going to get him. Arrest me if you need to.” Linda was resigned to not seeing St. Peter’s on this go around. One of the guards hustled to catch me, taking me lightly by the elbow and indeed, I thought as we approached a uniformed officer, “I am going to see the Vatican jail.” The tall uniformed officer listened to the security guard’s rapid explanation, which was probably something like “this insistent SOB wants to go into the church through the out door and he won’t be discouraged no matter what I say or do.” I explained the situation to the captain, and he walked with me back to the line. Linda was waiting patiently as floods of tourists streamed out past her. The captain softly said in my right ear, “Just apologize to the guard, tell him he is right and you are wrong.” And so, in a mixture of Italian and English, I did just that. Groveling while standing up is a skill I learned in the U.S. Navy. 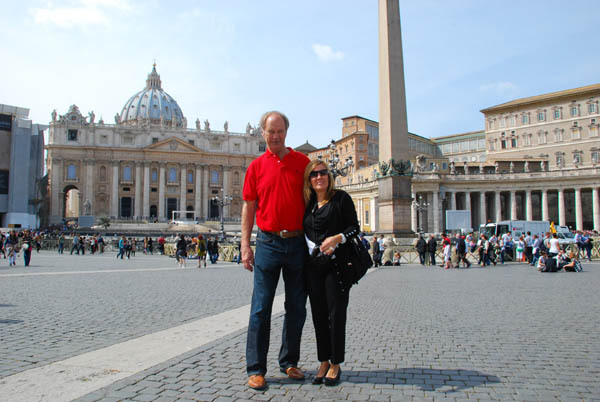 The guard relented, Linda was let in to see the incredible church of St. Peter and this time, just this time, I avoided a tour of the Vatican jail. I guess there’s always time for that on the next visit. Posted in Italy Tours and tagged basilica, peter, rome, st.